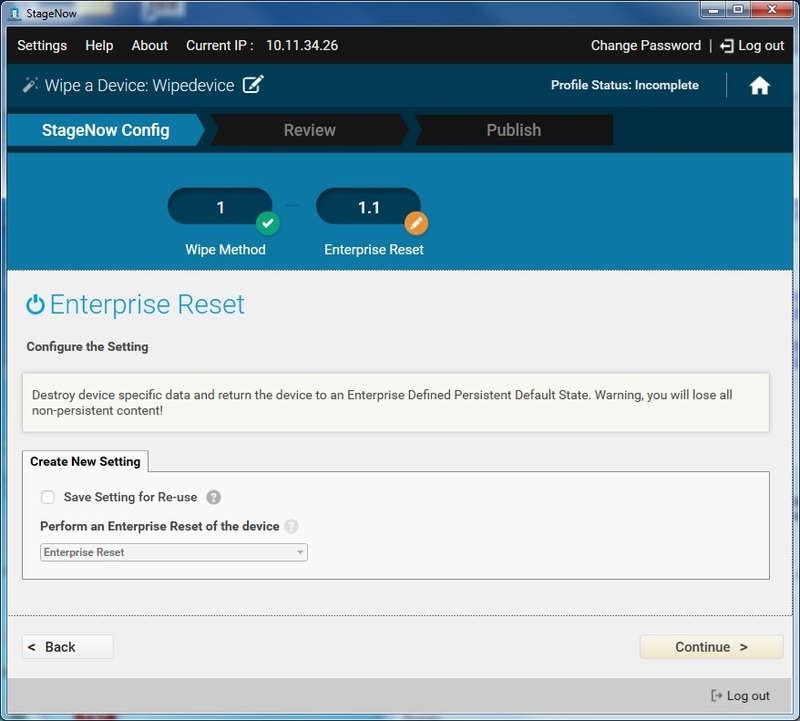 Use this Wizard to erase data on the device using Factory Reset (all data) or Enterprise Reset (only non-persistent data). See important additional information about reset actions. On devices with MX 7.1 or higher, it is possible to automatically bypass the Android Setup Wizard (also known as the "Welcome Screen") following an Enterprise Reset. More about Setup Wizard Bypass. On devices with Android M and higher, it's also possible to skip the Android Setup Wizard by scanning a barcode when the wizard appears or at any time thereafter. See below for details. 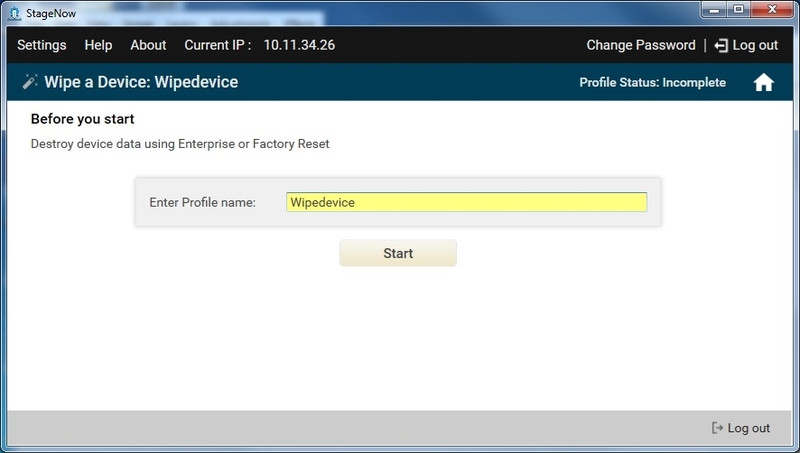 Select the "Wipe a Device Wizard" and select "Create"
Enter a name for the profile. Select "Start" to proceed. Note: During profile creation, an indicator at the top-right corner of the window displays creation status. Choose the desired erasure method. Select "Continue" to proceed. Select "Continue" to proceed to the Review window. When staging manually, it's possible to skip the Android Setup Wizard on devices with Android M and higher by scanning the barcode below at any stage of the wizard. On devices with Android N and higher, scanning the barcode bypasses the Android and Zebra Setup Wizards (including Analytics opt-out). If the Android Setup wizard is partially completed, data entered prior to the bypass scan is applied. 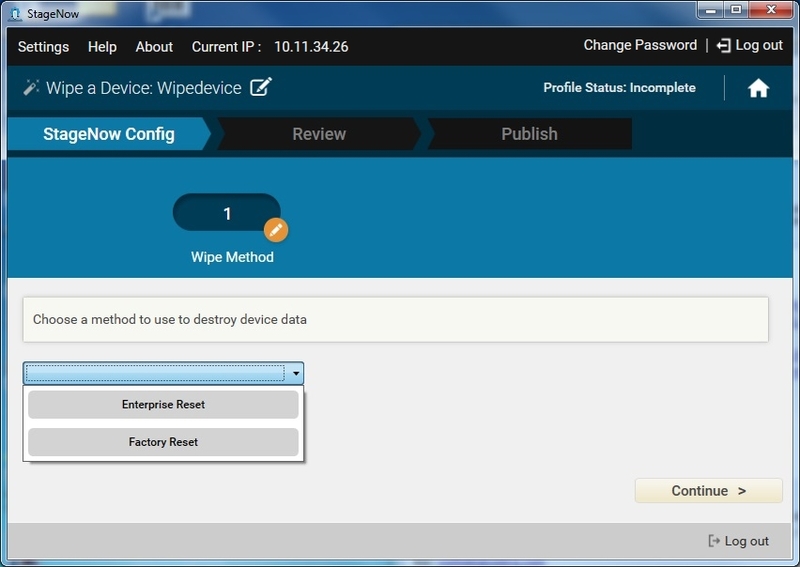 Android Setup-wizard bypass applies only to GMS devices; non-GMS devices do not employ the wizard. Scan-to-bypass functionality is present in all BSPs newer than those listed above. Go to Settings > About phone > Build number to display the BSP in a device. To update a device for use with the bypass barcode, visit to the relevant page below and follow instructions there.